I didn’t come up with this method for cooking beets, but I just have to spread the word. It’s easier than anything, and it means that I can still have the sweet taste of roasted beets in salads without having to use my oven on a hot summer day. 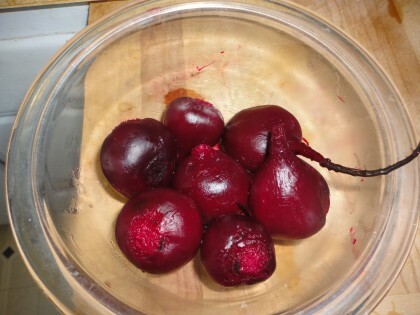 There’s plenty of places on the internet to find the basic method of “roasting” whole beets in your slow cooker, but I’m choosing to give you this link because I loved the name of the blog, Parents Need to Eat Too. I had smaller beets, so made two foil wrapped packages to fit into my slow cooker. I did exactly as she and others instruct; I left the tails and about one inch of the stems on the top. It was delightful to realize how easy the skins and the stems came right off with a slight dunk or rinse in cold running water. Like taking off gloves, only easier! I was so pleased with the texture and taste of these little beauties from the Farmer’s Market that I whipped up a quick dressing to go with them atop a stir-fry of various green plants from my garden: broccolini flowers, sugar snap peas, baby chard, orach and arugula flowers. 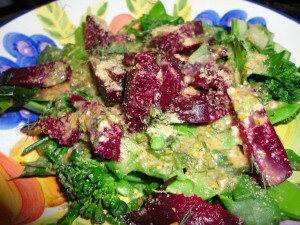 If fresh herbs are available, this easy, tasty fat-free dressing is as effortless as cooking the beets, only faster. Mix all this up in a little jar. Pour over salad. Refrigerate leftovers. Will keep for several days. Notes: If you don’t have lemon sage or lemon thyme, use regular, and add some lemon zest for a lemony lift. If you don’t have fresh herbs, use dried, but fresh are best, because they give this dressing its unique flavors. If you haven’t made sage flower vinegar, try using a tablespoon of apple cider vinegar and add a tiny bit of powdered fennel, or a few crushed fennel seeds or a sprig of leaves from a fresh fennel plant. 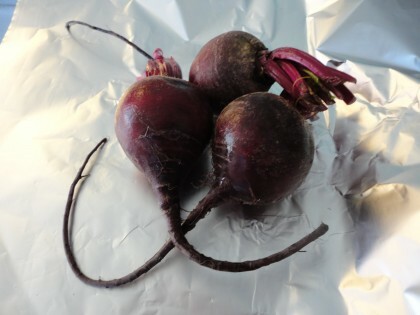 If you want to take the time to peel and cube your beets the night before, here is another slow cooker recipe for beets from Kathy Hester. It looks yummy too. She uses mint, and that might be a good substitute for the sage if you don’t have any. It will change the effect though. If I was going to use mint and/or parsley in a dressing similar to the one I came up with here, I’d choose a pureed red berry for the base of the dressing, such as raspberries or strawberries, rather than the orange juice. Bon appetit!! Yum! Thanks for this one. We love beets. I’ve been using my beets in a recipe called Nana’s Pickled Beets (http://allspicechronicles.com/cuisines/vegetarian/nanas-pickled-beets/) But the biggest challenge was converting those bunches of wonderful fresh beets into cooked beets. Now your sharing post has made that step easy. You’re the greatest! Perfect timing! I just happen to have some lovely golden beets in the fridge that I need to use! Brilliant idea to use the slow cooker (thanks for the link) especially since we are scheduled to hit 107 degrees today ;-( I have already put them in the cooker and set my timer – yum! I would like to verify that you do not use any liquid in the cooker when doing this (except for the dampness from washing them). I am a bit nervous about doing this without some liquid especially with them cooking on High. Thanks for the dressing recipe, it will be perfect with the beets! Hi Marcia, so neat about the perfect timing! No, I did not use any liquid, just wrapped the washed beets up tightly in little foil packages. It was just fine. Also, when I “bake” sweet potatoes in the slow cooker, I don’t use any water either. I do line it with baking parchment, so the sugars from the potatoes don’t stick to the pot. With regular potatoes that’s not necessary. Hope that helps. So glad the dressing sounds good to you. Enjoy your golden beets! I enjoy your blog so much, thank you! If you or your readers are concerned about heavy metal toxicity, you may wish to avoid having your food touch aluminum foil during cooking. Blessings and best wishes as you heal! Thank you, AmyLu, and thanks for the advice about the aluminum foil. I often line it with baking parchment as a preventative measure, but this time chose to let the original instructions stand. So thanks for giving us that option of extra care. Love this idea Maria. How long in the slow cooker? Did you use the high or low setting? Thanks, Karen, and welcome! I used high and cooked mine for 3 hours. If you click on the hyperlink Parents Need to Eat Too above in my blog post you’ll get the complete directions there. I was really impressed with how nice they came out. Next post: Let’s Do Lunch?